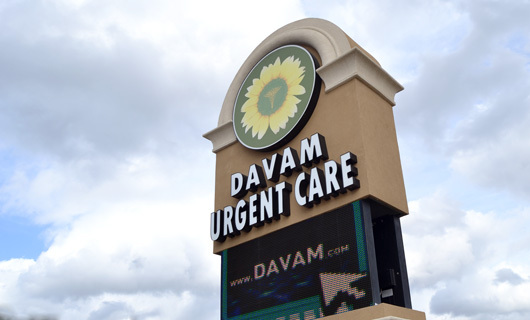 Davam Urgent Care located in Magnolia, TX makes it our goal to provide the best patient care to individuals and families living in the area. Our urgent care center is the best place to visit when you or your loved ones are suffering from a non- life threatening condition. Each patient will always be treated by an experienced medical provider. Why Choose Davam Urgent Care in Magnolia, TX For Your Urgent Care Needs. Extended hours. Our clinic is open daily, 8am-9pm. This allows patients the flexibility to visit us whenever works best for their schedule. Online check-in. Patients now have the ability to check- in online by visiting http://bit.ly/2iiWZdn. Patients can expect shorter wait times and more convenient care. Accredited Center. Davam was the first urgent care clinic accredited by the Urgent Care Association of America in the Houston area, and only the second in Texas. Accreditation is the highest level of distinction for urgent care centers. Excellent patient care and customer service. With over 1,000 plus 5 star reviews and many awards including Best of the Woodlands 2015, 2016, and 2017 it is easy to see why patients choose us for their care. Our goal is to provide a 5 star experience for every person who visits Davam. In addition- we also offer a fully stocked snack and coffee bar to make the visit experience more enjoyable. Additional services. Davam Urgent care is able to offer many additional services than the traditional quick care setting. This includes digital x-ray, lab testing, EKG, drug screens, laceration repair, and more. Our urgent care clinic is conveniently located in Magnolia, TX off off 1488 across from Home Depot. We offer online check-in and short wait times to allow for a convenient visit experience. Along with accepting most commercial insurance plans we also offer prompt pay discounted pricing at the time of service. For more information on the services offered and to visit Davam Urgent Care please contact us at (281) 583-1980.